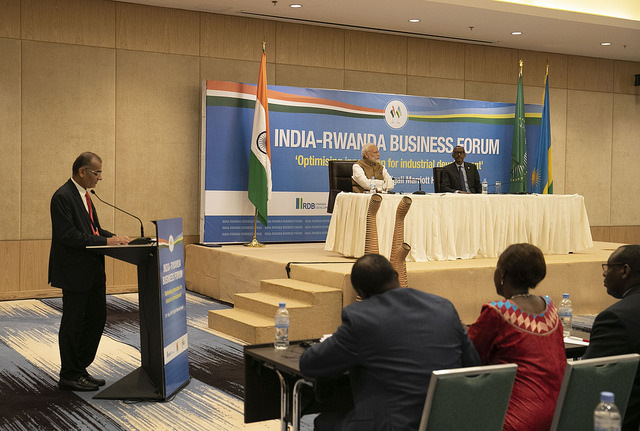 President Paul Kagame and Prime Minister Narendra Modi today joined 112 Indian business leaders and their Rwandan counterparts at the India-Rwanda Business Forum. 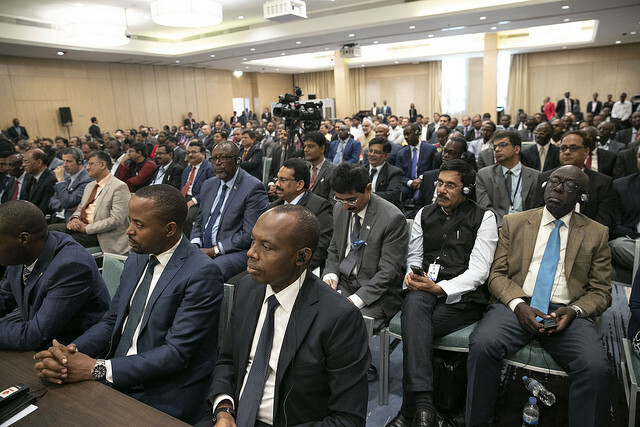 The first of its kind and organized by RDB (Rwanda Development Board) in partnership with the PHD Chamber of Commerce and FICCI- Federation of India Chambers of Commerce and Industry, the Forum’s aim is to further business ties between India and Rwanda. The Indian delegations included business leaders from the energy, ICT, manufacturing, services, automobile, real estate and construction, infrastructure, health (pharmaceuticals), food processing, transport and logistics among others. The Business Forum, under the theme ‘Optimizing innovation for Industrial Development’, sought to examine how the synergies between industrial and innovation policy frameworks could be harnessed to enable both countries to attain economic transformation. “Rwanda is keen to learn from the renowned “Make in India” experience, as we implement our own “Made in Rwanda” policy, particularly in the manufacturing, construction and ICT sectors. There are direct flights to Mumbai by our national carrier, RwandAir, and this is already facilitating travel and business. All Indian citizens are eligible to receive a visa on arrival in Rwanda. Should there be any obstacle in the way just let us know. We are eager to get going and to maximize these opportunities for the benefit of the people of our two countries and the rapid socio-economic transformation that we both seek”, President Kagame concluded. 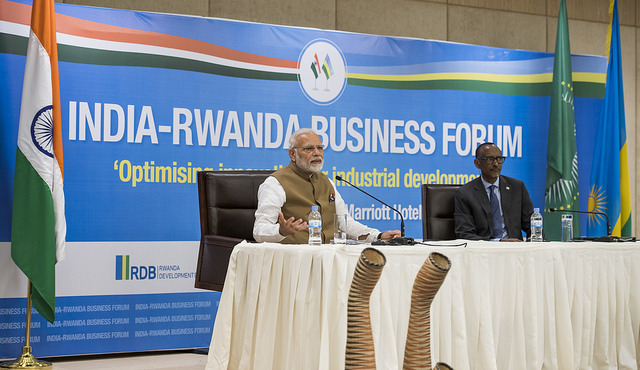 Speaking directly to the Indian business community, Prime Minister Narendra Modi noted that Rwanda was the gateway for the rest of Africa. This was, according to the Prime Minister, due President Kagame’s focus; namely development, prosperity of the people and peace in society. 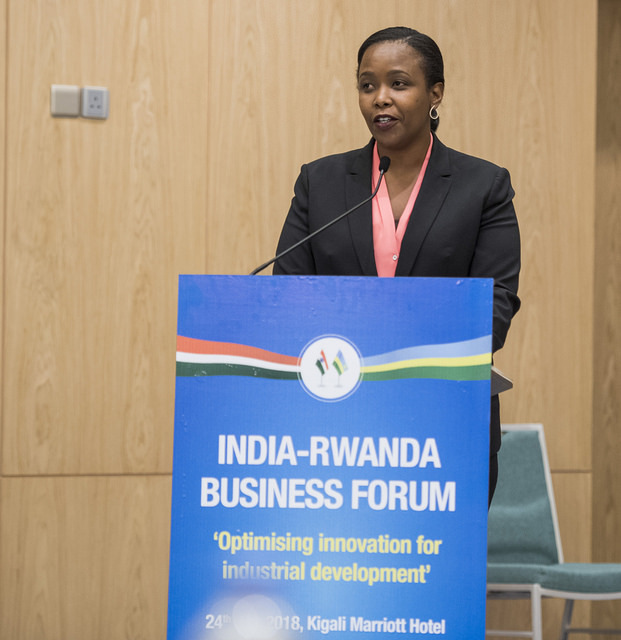 In her welcome note, the RDB Chief Executive Officer, Clare Akamanzi, noted that the visit of the Indian Prime Minister built on an already strong foundation of trade and investment in both Rwanda and India. “There are close to 99 projects registered from India, which are worth an estimated $389 million USD. These projects have contributed to estimated 10,175 jobs ranging from telecommunications/ ICT, to agriculture, manufacturing and healthcare. Examples include Airtel, Virunga Biotech Ltd, Marasa Holding; Accacia Property Development, Kabuye Sugar Works Sarl, Imana Steel Rwanda Ltd, Cardiac Specialty Rwanda, Rugabano Tea Company Ltd and Gisovu Tea Company Ltd”, she concluded. MOU between RDB and AVAADA POWER PRIVATE LIMITED (APPL) aimed at fostering cooperation between RDB and APPL Ltd towards APPL’s investment and support in the development of solar power projects in Rwanda. MOU between RDB and FICCI: with the aim to further strengthen their relation and promote economic and commercial cooperation between the two countries. MOU between the Private Sector Federation and the PHD Chamber of Commerce to establish and develop commercial links between the business communities of both countries in general and their respective members in particular.